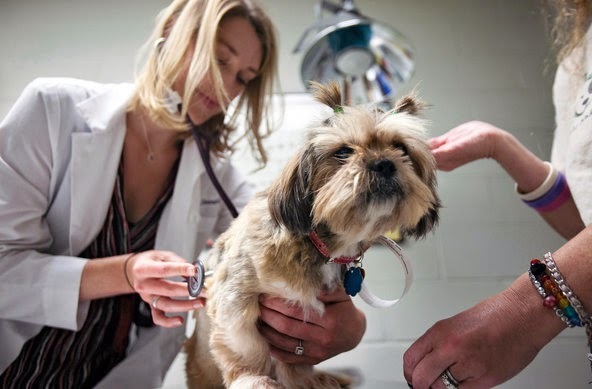 As in so many other areas where dogs have proved to be our best friends, dogs are now helping human doctors better understand and treat breast cancer. This post on The New York Times "Well" Blog, describes the possibly ground-breaking medical research being conducted at the University of Pennsylvania, where veterinary oncologists "...are learning about the progression of human cancer by treating mammary tumors in shelter dogs." It turns out that mammary tumors in dogs are strikingly similar to those in humans, and respond to the many of the same chemotherapy drugs used to treat people. Both veterinarians and MD's now have the opportunity to study not only the progression of cancer, but how it evolves at the molecular level. And it's a win all around because the humans learn and the shelter dogs get free treatment for life. And when a shelter dog is healthy, he or she is more likely to be adopted, like the adorable shih tzu, Akyra, who had successful tumor removal surgery (the tumors were non-cancerous), and now has the pleasure of daily romps on the several acres of property at her new forever home. We never knew they were similar. Def a win/win on the research. Have a fabulous Friday.